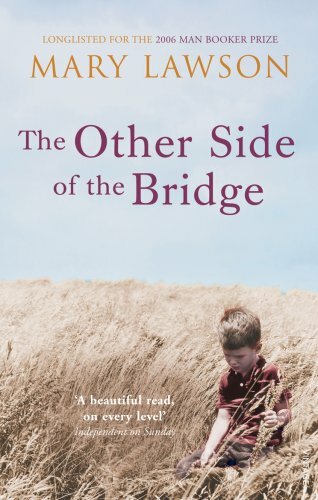 The Other Side of the Bridge is a beautiful book set in in Northern Canada about two brothers, Arthur and Jake Dunn who grow up on a small farm near Struan (a fictional town) in the 1930s. The brothers are poles apart in nature. Arthur is older, shy but reliable and hardworking, whereas Jake, the younger brother is handsome, reckless, unreliable and a troublemaker. Their story spans the 1930s and 1940s as they grow up through the Depression years and the Second World War, up to the early 1960s. There is much joy in this book mixed in with immense sorrow and pain. The title of the book refers to the time before and after a shocking incident on the bridge – a roughly made bridge across the river that separated the Dunns’ and their neighbours, the Lintz’s farms. It was a shortcut that saved more than a mile. The River Crow was fifteen feet below the bridge as it boiled its way over rocks. That incident changed not only Arthur’s and Jake’s lives but its effect lingered on the their community the rest of their lives. The Other Side of the Bridge is Mary Lawson’s second novel. I loved her first, Crow Lake (which I read ten years ago) and I love this one just as much. It’s one of the best books I’ve read this year. It was longlisted for the Man Booker Prize in 2006, which was won by Kiran Desai’s The Inheritance of Loss. Reading Challenge: the 21st book I’ve read this year for Bev’s Mount TBR 2017 – a book I’ve had for 10 years. It’s time for the third quarterly checkpoint for Bev’s Mount TBR Reading Challenge 2017 now that we only have 3 months of the year left to complete the challenge. I’ve not been doing too well with this challenge, mainly because I keep reading new books and library books! I’ve read 20 of the books I owned prior to January 1 this year, which takes me near the top of Mont Blanc (24 books). I hope to get back to reading my TBRS soon! Who has been your favorite character so far? And tell us why, if you like. My favourite character is one of the main characters in Winifred Holtby’s South Riding., Mrs Beddows. She was the first woman alderman of the district, a strong older woman (age 72), a generous, warm-hearted, compassionate and charitable woman, dedicated to fighting poverty and wanting the best for the South Riding and its people. Colin Dexter’s The Dead of Jericho is set in a city – Jericho is an area of Oxford – with a male detective – Inspector Morse, whereas A Death in the Dales by Frances Brody is set in and around Langcliffe, a village in the countryside of the Yorkshire Dales, with a female sleuth, Kate Shackleton. 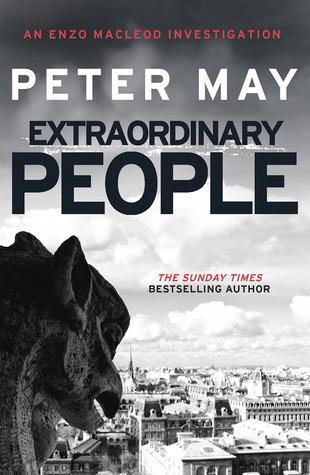 I loved Peter May’s Lewis trilogy and I also enjoyed his standalone book, Entry Island, so I decided to read Extraordinary People, the first in his Enzo Files series when I saw a copy in a secondhand bookshop (along with the second in the series, The Critic). They are both TBR books. Set in France the action moves between various locations, but is mainly in Paris, as Enzo Macleod tries to solve a cold case mystery, that of the disappearance and presumed death of Jacques Gaillard, an eminent professor, 10 years earlier. Enzo is trained as forensic scientist, who is now a professor of biology at a university in Toulouse. He has taken a bet that he can solve seven of the most notorious murders, using modern technology. Journalist Roger Raffin had originally researched the Gaillard case and shares his information with Enzo and accompanies him on the search. It helps that a metal trunk had been found in the catacombs under the Place d’Italie, containing a skull and a number of apparently unconnected items. Enzo succeeds in establishing that it is Gaillard’s skull and using the items in the trunk as clues begins the search for the rest of his skeleton. This takes the form of internet searches, DNA investigations and leaps of intuition, ending up in a dramatic scene back in the Paris catacombs. Enzo’s own life is in danger and that of his elder daughter, Kirsty. There is quite a lot about Enzo and his family background. He is of Scottish/Italian parents, with a complicated personal life. He has two daughters, by different mothers. Kirsty refuses to have anything to do with him, whereas Sophie who dotes on him, lives with him, whilst Enzo can’t stand her boyfriend. I had a couple of small issues with this book. It takes the form of a puzzle and a chase to find the culprit, much in the same vein as Dan Brown’s books. I did find it rather implausible that the murderer would have left such specific clues and although Enzo does raise the question of why anyone would do that, it’s never properly answered (to my mind at least). I also questioned why the French police ordered him to leave the investigation solely to them without using his obvious skills and knowledge (there is a reason for that, which I quickly surmised). Another little niggle is the way May interspersed the text with French words for some items, but not others – the word séjour is used a lot but other rooms such as ‘bedroom’, ‘hall’ are in English – a minor quibble I know, but each time I read it I wondered why. But, having said all that I did like the book, it’s very readable and I learned a lot about Paris and its catacombs. Reading Challenges: my 3rd book for the RIP 2017 challenge and my 20th book for Bev’s Mount TBR 2017. 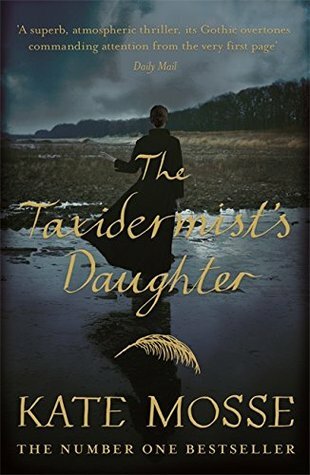 The Taxidermist’s Daughter is a difficult book to review without giving away too much detail particularly about the element that almost made me stop reading and because of that I was in two minds what rating to give it. The main thing that I didn’t like is all the detail about taxidermy – and there is a lot of detail. I found its gruesome application in this book absolutely sickening. But I still read on, such is the strength of Kate Mosse’s ghoulish storytelling. 1912. A Sussex churchyard. Villagers gather on the night when the ghosts of those who will not survive the coming year are thought to walk. And in the shadows, a woman lies dead. As the flood waters rise, Connie Gifford is marooned in a decaying house with her increasingly tormented father. He drinks to escape the past, but an accident has robbed her of her most significant childhood memories. Until the disturbance at the church awakens fragments of those vanished years . . .
Connie Gifford is the taxidermist’s daughter and she has grown up learning the art of taxidermy, taking over from her father who is a hopeless drunk. Her mother had died giving birth to her and there had been an accident when she was twelve (ten years earlier), which had almost completely wiped the first twelve years of her life from her mind. The book began well, full of atmosphere, set in the Fishbourne Marshes and the tidal estuary in West Sussex (where Kate Mosse grew up), with Gothic overtones and hints of dark and terrible secrets and revenge. There is the mystery of the dead woman who has been garroted – who was she? What, or who haunts Connie’s father? What had happened to Connie when she was twelve, and who was the girl Connie vaguely remembers – older than her, with a love of life and a yellow ribbon in her hair? She experiences strange episodes where she feels herself falling out of time, spinning and flying through the air – episodes full of menace and threat. But it dragged in the middle, with too many indistinct male characters and even though there is a map showing the layout of Fishbourne in 1912 I had difficulty in following the location of the action, nor could I work out how quickly they seemed to be able to travel between the various houses and Chichester. It ends dramatically in death and destruction, with all the strands of the story coming together, one dark and stormy night. The waters rise, as the banks of the rivers, streams, the mill pond and the sluice gates break, flooding the whole area. Connie’s memories too come flooding back as the wind and rain join the thundering torrent of the flood water. After a while though too much was foreshadowed and the story became rather predictable, which lessened the tension. Its gruesomeness however will stay with me for quite a while. The community of South Riding, like the rest of the country, lives in the long shadow of war. Blighted by recession and devastated by the loss, they must also come to terms with significant social change.Forward-thinking and ambitious, Sarah Burton is the embodiment of such change. After the death of her fiancé, she returns home to Yorkshire focused on her career as headmistress of the local school. But not everyone can embrace the new social order. Robert Carne, a force of conservatism, stands firmly against Sarah. A tormented man, he carries a heavy burden that locks him in the past. As the villagers of South Riding adjust to Sarah’s arrival and face the changing world, emotions run high, prejudices are challenged and community spirit is tested. 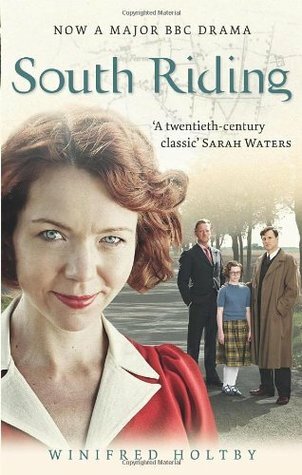 I bought Winifred Holtby’s sixth and last novel, South Riding, after watching the BBC television adaptation by Andrew Davies, starring Anna Maxwell Martin and David Morrissey, broadcast in February 2011. And I’ve only just got round to reading it – it was well worth the wait. It’s one of those books that make you feel as though you are there taking part in the action – I was totally immersed in the story and I loved it. The book was first published in 1936, six months after Winifred Holtby’s death, aged 37, from Bright’s disease. Set in the early 1930s in Yorkshire it paints a moving and vivid portrait of a rural community struggling with the effects of the depression. South Riding is a fictional place – Yorkshire consists of a North, East and West Riding – there is no South Riding. The word Riding is derived from a Danish word ‘thridding’, meaning a third. The invading Danes called representatives from each Thridding to a thing, or parliament and established the Ridings System. South Riding is based on the East Riding where Winifred Holtby’s mother was a county alderman, but she explained in a prefatory letter to her mother that Alderman Mrs Beddows was not Alderman Mrs Holtby, that the characters were not her colleagues on the county council and that the incidents in the book were not derived from her mother’s experience. Nevertheless,the main focus of the novel is centred on local politics and the work of the county council in dealing with a variety of issues including social issues, education, unemployment, local building programmes, poor relief and the treatment of the insane. There is a large cast of characters and a list is given at the start of the book, which I found most helpful. I could go on – all the characters are clearly defined and well rounded people and the locations bring the area to life, showing the contrast in living conditions between the different sections of society. In short South Riding is a wonderful book, portraying life in the 1930s. I would very much like to re-read and enjoy it again and again. I’m sure that I would find plenty in it that I’ve missed on this first reading. South Riding is my 18th book for Bev’s Mount TBR 2017 challenge and my final book for Charlie’s What’s in a Name Challenge 2017.